It was the holy month of Ramadhan. Some of my colleagues, pursued by the spirit of devotion, routinely visit Masjid Al-Azhar for the Tarawih prayer, as for the rest of us including me were driven by the spirit of….. satisfying our growling stomaches! It’s 7 PM and we haven’t had any decent breakfasting menu so the idea about Nasi Kebuli seemed to be intriguing. Just behind the Masjid, we found hawkers everywhere including the famous Roti Bakar Eddy, though I haven’t tried it myself. The stall that we’re looking for was Nasi Kebuli H. Ali. After we got seated, most of us ordered Nasi Kebuli Kambing and one of my colleagues had the one with chicken. 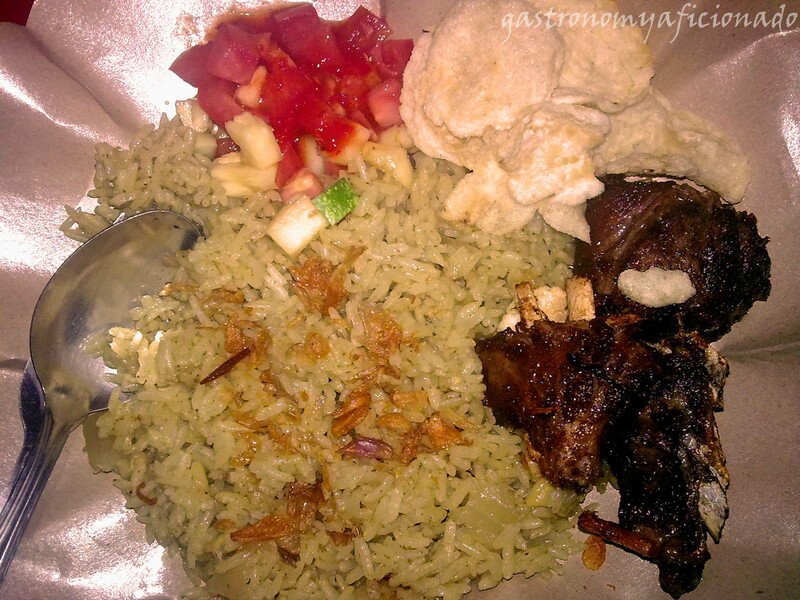 Just in case, if you’re not familiar with this dish, it’s actually a variant of the famous Biryani Rice. The essence of this cuisine was actually rice with many condiments and spice added with meat and pickles, but the combination of the ingredients and the name may vary between countries and in our case it’s become Nasi Kebuli. If it’s Middle Eastern or Indian/Pakistani, best to pick lamb/mutton as the meat. For the moderate price of IDR 25,000 for lamb and IDR 20,000 for chicken, the taste was just ordinary. It’s not that spicy and fine for me though the humidity of Jakarta can be cruel even at night, so I got sweaty a bit but that’s okay like Chef Anthony Bourdain used to say while he’s eating, ‘I’m sweaty but I’m happy’. Anyhow, it’s a quite okay dinner and we all went away full but I was left unsatisfied. Hi, Rizki. Thanks for coming! Kalo boleh disampaikan, Sejujurnya masih banyak yg perlu dibenahi dari rasanya. Startnya udah bagus, tinggal dipoles dikit lagi biar bisa lebih maknyus lagi dan pastinya ramai dikunjungi! Thanks! Yup. This is my hobby. I wanna take my epicurean style in food into the whole new level and there she is, my blog here. i think H. Ali kebuli made of goat instead of lamb bro….